Earlier today, I was just checking some rankings in Google for Enquiro. 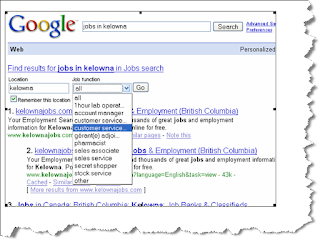 I performed the query "jobs in kelowna" to see where our careers page was ranking... while I was logged into my Google account I received a job search function at the top of the organic results.... I tried a search for "jobs in seattle" and received similar results. I did not get these results when I was not logged into my Google account. This was something new to me. I had not seen this before. Is this a new addition to personalized search results? As I mentioned I had not seen this before and thought that it was a pretty cool feature for users who where searching for job opportunities online.